MASKerade: CTS96 - Happy Birthday! Here's my card for the current CAS(E) This Sketch challenge. Those black dots were not stamped individually - I have a row of them (very old - could they be Papertrey?) so I don't need to try and space them out too perfectly on my own. The sentiment is from Simon Says Stamp. 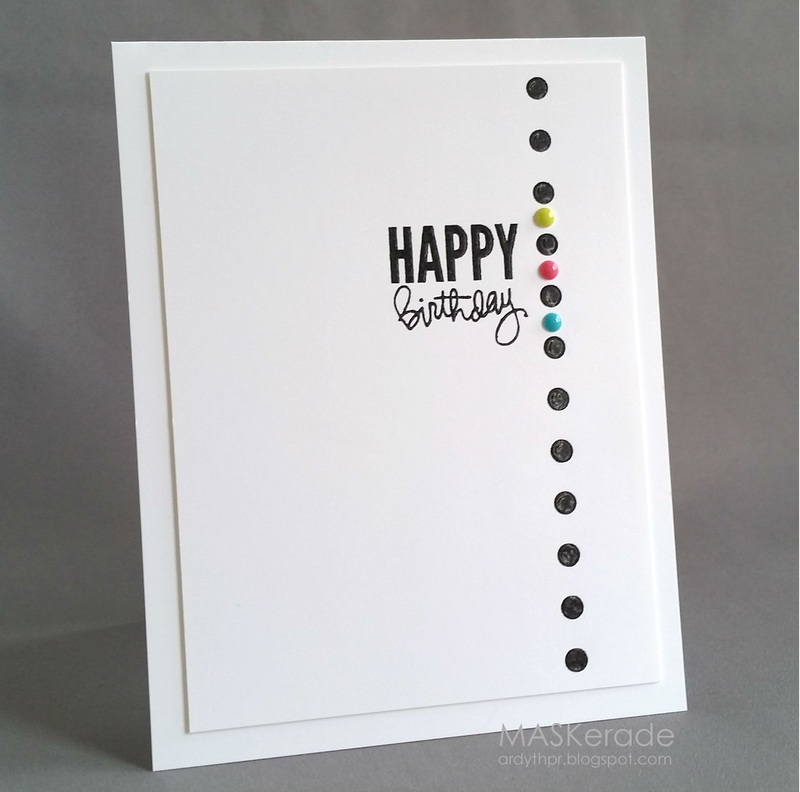 Both the dots and the sentiment are stamped in Versafine Onyx and embossed with clear ep. I added the 3 little ceramic dots for some colour and shine. Thanks for the clarification on the row of black dots! Of course, the moment I saw them I thought "wow - how did she get those dots spaced so perfectly?" Great idea to add the enamel dots - it really highlights the sentiment well! Anything exciting planned for the weekend? Fabulous card. I like that you only added a little bit of color right at the sentiment. Absolutely love this CAS card Ardyth! Great take on the sketch. Fabulous - your card is just CAS perfection. Very, very cool card, Ardyth! You make CAS into a masterpiece every. single. time.